Winter getting you down? Well come to Lake of the Ozarks this weekend for the annual Mardi Gras Pub Crawl. Buses start at 4:00 p.m. with the schedule below. Wrist bands are $10.00 each and can be purchased at any the of bars/restaurants that night or before the event at any of the 17 participating locations. Leave your keys and take the bus!!! 32 total buses run from 4:00pm til 2:30am and will get you to and from your designated lodging facilities with no need to drive. We provide the sober chauffeur and all you have to do is kick back, leave your keys in the drawer, jump on a bus and have fun. Hotel shuttles are provided to get your crawl started and route buses stop at every location on the CRAWL!!! To view the entire schedule click here. 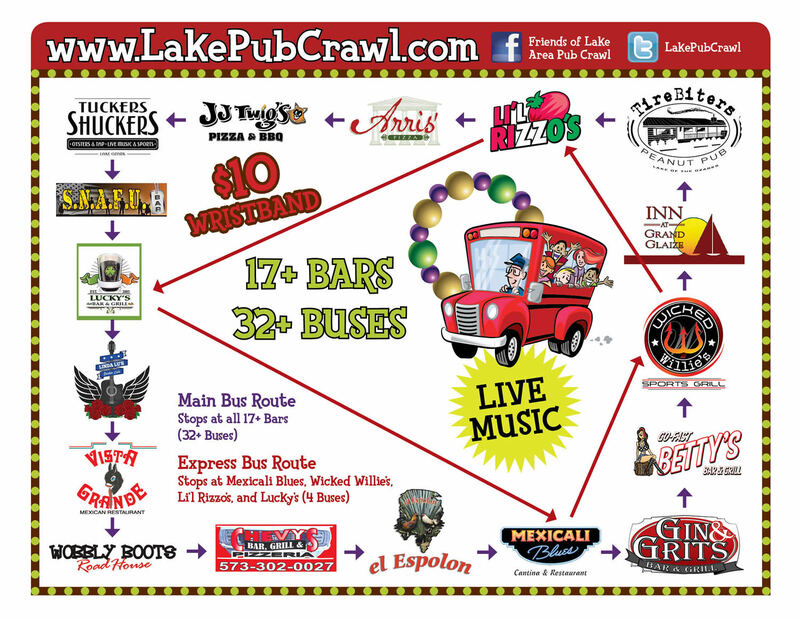 Also new this year is text LAKEPUBCRAWL to 71441 for Pub Crawl news.